Long-term investors are not supposed to make market timing bets. That means you, CalPERS. Even though CalPERS has an army of high-priced investment professionals giving it advice, staff has somehow managed to get the board to give it latitude to make some marked changes in asset allocation on a discretionary basis. And as I understand CalPERS’ pay formulas, the worst is that staff has upside for taking bets that pay off, but they don’t get dinged if their wagers hurt beneficiaries. Even if the system is loath to dock salaries of give zero bonuses (although that calls into question what “bonus” means), you would think CalPERS would come up with a quasi-clawback method, like having, say, 1/2 of bonuses held back over a five year period and docked if staff underperformed return targets. For instance, in his reinsurance unit, Warren Buffett pays out 15% of profits as bonuses….five years in arrears to make sure that all possible costs and losses have been charged against them. CalPERS under its chief investment officer Ted Eliopoulos has been too clever, in a bad way, over the last eighteen months. It cuts its allocation to US stocks just before Trump took office, getting less benefit from that rally than it could have. CalPERS has had a 50% allocation to foreign stocks for years, betting on a weak dollar environment when the dollar has been strong. It cut its foreign investment targets, and if my recollection is right, not long before the dollar started to weaken. This change was approved at the December 2017 board meeting. My understanding is that asset allocation changes in liquid markets are typically implemented in a fairly expeditious manner. “Inflation assets” is mainly TIPS, with some commodities, mainly tracking the Goldman GSCI, which is about 80% oil-related. So CalPERS dumped TIPS, which have been going nowhere for years, just as they were rallying as investors are getting edgy about inflation. Having said that, oil rallied over 2017 but with the market swoon, hasn’t gone much of anywhere in 2018. CalPERS increased its wager on fixed income, which looks like a violation of the classic investment rule, “Don’t fight the Fed.” That does not look like a great move given that the Fed has not been making market-reassuring noises even with the stock market decline of this week. It looks as if the central bank is keeping its eye on the fundamentals and the data keeps looking generally positive by “new normal” standards. And as for equities, CalPERS, having missed most of the Trump rally, looks to be getting in late, which could prove to be too late. Finally, CalPERS was so convinced that this was the time to go into “risk on” mode that it cut its cash levels. But since everyone at CalPERS gets praised for merely showing up, you can be sure that nary a critical word will be said about these moves. CalPERS, like the Trump Administration, lives in its own bubble. This entry was posted in CalPERS, Investment management on February 9, 2018 by Yves Smith. Didn’t you publish a long critique when CalPERS moved to an outside, professional management model as well? It isn’t a secret that CalPERS staff have been nearly always wrong regarding big changes in the portfolio. Seeking “professional help” seems like the grown up thing to do. No? No, outsourcing private equity, if that is what you are referring to, is not “moving to an outside professional management model”. It is paying an extra layer of fees to escape transparency. There are tons of other public pension funds that use experts well. Go look at CalSTRS board meetings, which are also all videoed, to see the difference. The board is engaged and regularly pushes back on what the consultants and staff are saying. They are wrestling with tradeoffs and trying to make good decisions. By contrast, the CalPERs board has abdicated to staff and has allowed it way too much delegated authority along with unduly permissive bonus targets and too many incentives to take risks like making market timing bets. And to make a bad situation worse, the Chief Investment Office, Ted Eliopoulos, is not qualified to do the job and has handed off as much responsibility as he can, turning it into an admin role and shirking the duties he is supposed to be performing to justify his lofty pay, that of….managing investments! No the grown up thing to do would be to admit you have no clue how to invest, step down, and let people that know how to invest do the job. Outsourcing is never the right answer. 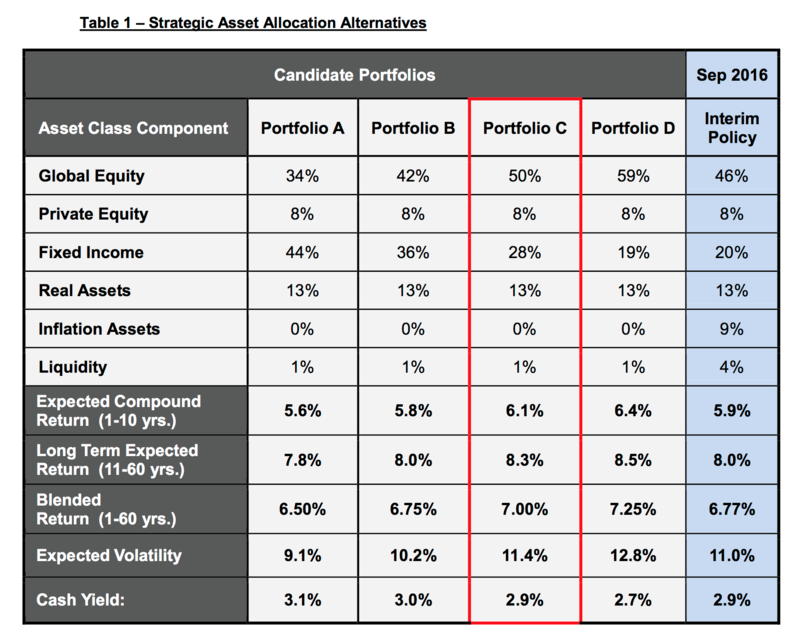 What’s disturbing in the candidate portfolios chart is the apparent chasing of return. Portfolio C conveniently converges to exactly the lofty 7.0% expected return that CalPERS is gingerly ratcheting down to over several years. But these forecasted returns, which include bubbly results from the second half of the 20th century, are flat wrong at today’s valuations. Clearly, it would be impossible to reliably generate a 7.5% return from a diversified portfolio of items taken from the above menu. CalPERS’ maliciously false forecasts fit the blended returns to political constraints. These are not honest numbers and they will not be achieved. Any self-respecting financial analyst would resign rather than sign off on this putrid load of swill. It almost sounds like that if you follow what CalPERS is doing financially – and then do the opposite – that you will fare much better on your investments. Pity there cannot be a system in place where bonuses are based on CalPERS performance as averaged over, say, a five year span. Too much to expect? Hmmm, how can one short CALPERS? Short REITs with big CA presence….as very long term, Calpers shortfall will be made up via moarrrr taxes. Driving the middle class to AZ or NV. Just wanted to add that as a long-term investor, CalPERS shouldn’t even be making substantial, short-term or rapid changes to its portfolio mix. If they sincerely believed their projected “11-60” year returns, they shouldn’t need to make massive changes every year or two. To do so serves no purpose I can think of, except one – perhaps it serves to invalidate the prior predictions before they can be proven wrong? Would be interesting to get a historical record of CalPERS’ prior allocations, and then apply subsequent market return data. Did any of the changes actually do any good, compared to a “stay the course” approach based on, say, 1993 allocations? Or did they just create churn and fees and expenses?